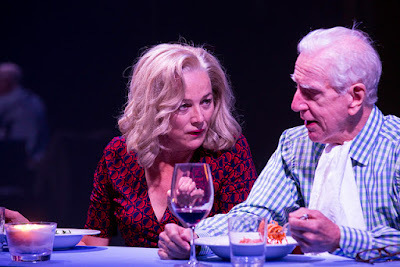 Belvoir Theatre presents, MARK COLVIN'S KIDNEY, by Tommy Murphy, in the Belvoir Upstairs Theatre, Belvoir St Surry Hills. 25 February - 2 April. MARK COLVIN'S KIDNEY, is a new Australian play by Tommy Murphy. There are some 28 characters. The play, however, is virtually a two-hander involving a true story concerning Mary-Ellen Field (Sarah Peirse) and Mark Colvin (John Howard). Elle MacPherson, an ex-pat Australian business woman, hires another ex-pat Australian, business advisor, Mary-Ellen Field, to sort out her business arrangements. Some time into their trusting relationship, some negative articles begin to appear in the press. Ms MacPherson, taking advice from other aides, suspects the 'leaks' for the said articles were coming from Ms Field. She is gradually removed and loses her job with her sense of self-worth and dignity, even her sanity, gravely shaken. Then, the News International phone-hacking scandal broke, and the ex-pat Australian magnate, Rupert Murdoch and his great Corporate Company become the centre of the Leveson Inquiry. Ms Field from intimation of others suggests that the negative articles for which she was blamed concerning Ms MacPherson originated in that phone-hacking scandal. She decides to fight for justice and the restoration of her name. No-one is particularly stirred. Then a chance inquiry from an Australian ABC journalist, Mark Colvin, brings some hope of action. During this long-distance co-operation, Ms Field who has never met Mr Colvin discovers that Mr Colvin is dying from a failing kidney and offers to give one of her kidneys in a transplant operation, if, at all, medically feasible. It is. She does. This is a fantastic, unbelievable plot that is 100% true. Mr Murphy in his indefatigable research and then organisation of such, has sculptured a play. It is an amazing feat of determined scholarship and poetic licence. In 25 scenes across countries and time a coherent stage story is hewn and evolves. The malfeasance of a great Corporation and the sense of its crushing power to all that is just and right in our times is counterbalanced, in this play, with the altruistic act of one individual to another. That Mary-Ellen Field is the 'victim' of the first and the 'hero' of the other is what interests Mr Murphy. This act of goodness, at the risk of one's own life, in a world dominated by such 'wickedness' and corruption can represent, for some of us, a hope for the survival of mankind. Mary-Ellen Field in the midst of her plight when the societal structures that she trusted - 'the law, the state, the press, even the simple decency of other human beings have failed her' still has the capacity in this ethically deficient world, to make a decision to risk herself for the sake of another. While there is one 'good' person there is hope. (So, they say. So, one would like to believe.) This is the story, the moral spine of Mr Murphy's MARK COLVIN'S KIDNEY. Kit Esuruoso, Christopher Stollery, Helen Thomson and Peter Carroll (especially, as the husband, David Field) are herculean in the creating of thumb nail sketches of character off the page to the stage, that are sometimes, in the writing, more mere function and less than flesh-and-blood forces. Sarah Peirse is breezy and amusing in creating this feisty, intelligent woman, Mary-Ellen, whilst Mr Howard gives an avuncular performance as the mainstay of his creation of Mark. The Set Design by Michael Hankin, a whitish opaque reflective set of walls, with wheeled on furnishings is dexterous in its facilitation for location change, while Julie Lynch's Costume design is invisible, essentially - except for that awful wig that Ms Peirse wears - and miraculous in what must amount to a multitude of speedy quick changes - it is, on contemplation, a kind of miraculous design wizardry. The Lighting, by Damien Cooper, is pragmatically simple, whilst the Sound Design, by Nate Edmondson, is a little over loud and hostile to the need of the play. The problem with this production of MARK COLVIN'S KIDNEY, Directed by David Berthold, is that it lacks the clarity of its spinal theme. It is all in there, but not, either, in the Direction or writing unequivocally visible. Too, the production lacks theatrical momentum. There is no accumulation of energy in the story telling, it, relatively 'plods' alone at a steady, consistent rate and has, us, the audience often having to suspend our emotional endowing and willingness to identify with the events, in a cathartic-free state - we watch rather than participate. Whether this is to accommodate the many scene changes that the writing requires or just a failure of imagination, by Mr Berthold, is interesting to think about. For instance, the first act curtain scene, Scene 15: THE OFFER, is two lines long, and takes less than 30 seconds to deliver. However, between the end of Scene 14, the stage set-up into Scene 15 takes at least two minutes of suspended imaginative and emotional time. This is particularly odd, for when returning into the action, after interval, we continue on Scene 15: THE OFFER (CONTINUED). Odd? This is an entertaining middle-of-the-road production of a play that has a moral heart that is rare in contemporary Australian storytelling. It reminded me of the Terence Rattigan masterpiece, THE WINSLOW BOY (1946) where a father fights for right and justice for his young son, even at the risk of destroying his family and his own life. That play's construction and thematics are classic of their kind. Clear and emotionally accumulative. Thanks for yet another astute, thorough review. I thought I was the only one who felt Mark Colvin's Kidney lacked theatricality. Not a documentary, but a filmatic way of telling a terrific, true story, told on stage. Extremely well written, Tom Holloway is such an interesting writer. We'll see it on the big screen for sure. Chimerica, another great story, a terrific evening in the theater ... but again, told as a film, which the set enhanced. So tired of this Australian convention of adding this sense of naturalism, actors wheeling set pieces and props in an out. It doesn't matter how efficiently it's done, it disturbs the rhythm, distracts out attention, even if just for a few seconds. Why do we need to see 20 students wheeling in 20 chairs to sit on while a scene takes place in a cabin? Or does a scene in a restaurant become more 'real' or convincing because student actors are sitting at tables in the background?